Prince Harry is weeks away from welcoming his first child with wife Meghan Markle, but seems that some people still don’t know about the Duchess’ pregnancy. Meghan’s due date is quickly approaching, as she’s believed to be giving birth in late April. She’s been out and about at royal engagements, and her blossoming baby bump was hard to miss – but turns out that some people missed the pregnancy memo. 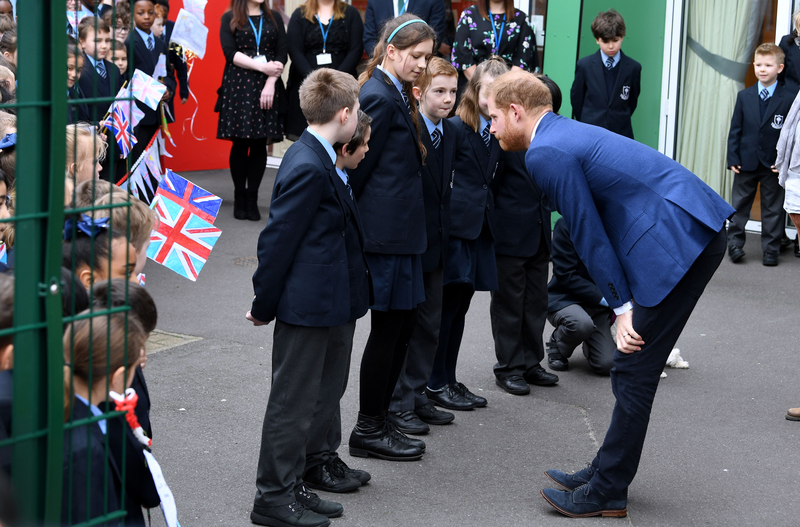 While at a royal engagement at St. Vincent’s Catholic Primary School, the Duke of Sussex had to answer some very funny questions from the kids, like ‘when the real Prince Harry was coming’. But perhaps the funniest episode at the event was Harry explaining to children that his wife was pregnancy – presumably because they asked why she wasn’t with him. The moment was captured in video and shared on Twitter, with many commenting on the fact that Harry must be getting really excited to meet his baby. Another added: ‘I bet he’s excited ’. At the event, Prince Harry was also seen practising a clever parenting trick that is also often used by his brother William and sister-in-law Kate – active listening. He was pictured kneeling to speak to the little ones who came to greet him, something Meghan already often does when meeting children. The act of going to children’s is part of active listening, as this body language shows they’re giving the child their full attention. Kensington Palace have confirmed Meghan won’t be attending any more public engagements, but will be taking private meetings until she properly starts her maternity leave. The Duchess of Sussex is likely to take six months off after the birth of her first child, but she might make an exception to attend to Trooping of the Colour in June – just like Kate did after giving birth to Prince Louis.